We have the experience in building not only armored trucks, bulletproof trucks, armored security vehicles, inter-bank vehicles and mobile banking vehicles, but also refrigerated van bodies, dry freight bodies, busses and trolleys. 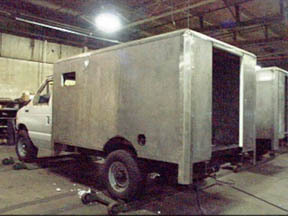 Our extensive experience building so many different types of bulletproof truck bodies allows us to take an innovative approach by sharing information and knowledge across product lines, including armored trucks, bulletproof trucks, armored security vehicles, inter-bank vehicles and mobile banking vehicles. Our armored trucks, bulletproof trucks, armored security vehicles, inter-bank vehicles and mobile banking vehicles meet or exceed the Federal Motor Vehicles Safety Standards (FMVSS). 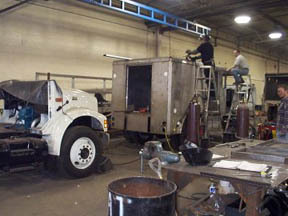 We are committed to safety, durability and unparalleled service in all the truck bodies we build. #1 Armored Vehicles and go to great lengths to ensure that our products are uniform and achieve a consistent quality across the fleet we build. #1 Armored Vehicles understands fleet consistency in appearance and construction is important to armored operators today. We meet that need. 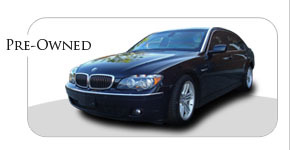 All in all, there is a #1 Armored Vehicles model to fit your requirements and specification. As a result of #1 Armored Vehicles staff having a background in the armored industry, we go to great lengths to include in our truck design the little details that go a long way to reduce exposure to workers compensation claims and motor vehicle accidents, as well as increase overall productivity and the crew's satisfaction in working out of the vehicle. We truly do look at our trucks from the operator's perspective to try to take advantage of every opportunity to add value to your operation. 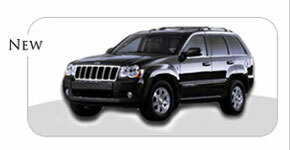 #1 Armored Vehicles offers a wide variety of interior floor plans to meet your operational and security procedures. We up fit several variations of bulkheads, currency bins and lockers, drop safes, shelving modules, hand cart holders, etc. We also design a multitude of cargo containment systems to securely and completely hold a wide array of liability. We are capable of custom designing any floor plan to meet your needs. We also stock several models of completed armored vehicles at all times to meet those emergency needs that frequently occur in the industry. We have the capability to deliver complete units in just a few days, painted your color scheme, upon your call. We understand the constraints and demands your customers put upon you to fulfill your contractual commitments. We can fulfill your needs for armored trucks and bulletproof trucks with similar commitments.